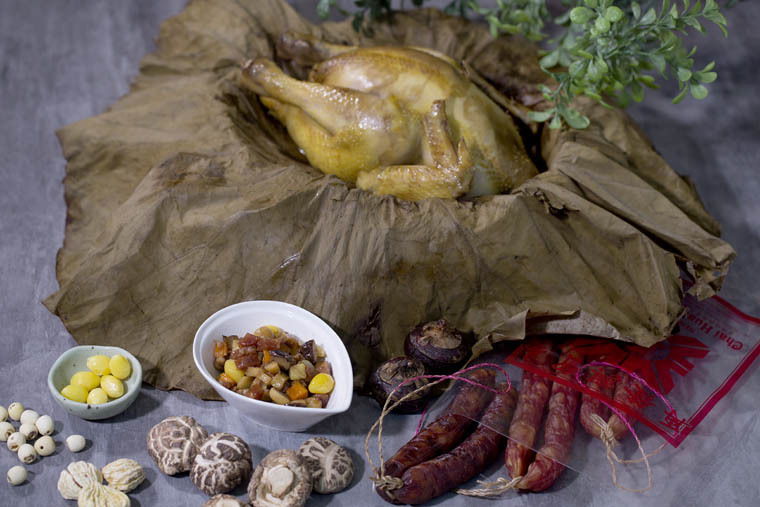 Chicken is a must-have on a Chinese family table during Chinese New Year. Traditionally, the chicken should be served whole (along with its head and feet) to symbolise prosperity and togetherness. Chai Huat Hin commissioned me to create a dish that is interesting and impressive. I decided to make Eight Treasure Chicken - where we have eight different ingredient to fill the chicken and then wrapped it in fragrant lotus leaf. The other ingredients like Chinese sausage and liver sausage give it a boost of flavour. Step 2 MIX SEASONINGS: In a bowl, mix seasoning. Step 3 FRY FILLINGS: Heat oil and stir-fry garlic until fragrant. Add in sausages and mushrooms, fry until fragrant. Pour in carrots, lotus seeds, and chestnut. Fry for a while. Add gingko nut, water chestnut, and seasonings, and stir-fry until all ingredients are mixed well. Step 4 BRAISE FILLINGS: Pour in water and braise until water evaporates. Step 5 STUFF & WRAP CHICKEN: Fill stuffing into the chicken cavity and secure with toothpicks. Wrap chicken in the soaked lotus leaf. Step 6 STEAM CHICKEN: Steam chicken for 1 hour or until cooked. Step 7 SERVE: Unwrapped lotus leaf and serve. Make the filling ahead and freeze. You can make the superior stock (for Braised Sea Cucumber and Abalone), Golden Dried Oyster Rolls, and this filling ahead. Freeze it in a container. On morning of Chinese New Year eve, take it out of the freeze and leave it in the chiller to defrost. Omit the lotus leaf if you like The lotus leaf impart a pleasant fragrance and makes it looks attractive. However, it its too troublesome, you can omit using it. Steaming the chicken without the lotus leaf is fine too. Instead of the usual steamed whole chicken, why not try this auspicious eight treasure chicken wrapped in fragrant lotus leaves?